A pilot has died in a helicopter crash in North Yorkshire. 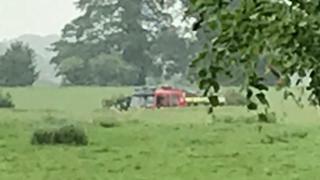 The aircraft came down and caught fire in a field at about 13:20 BST near the town of Boroughbridge. Police said there were no passengers onboard and the dead man has not been identified. Supt Dave Hannan said North Yorkshire Police are working with the Air Accidents Investigation Branch and the Civil Aviation Authority to establish what the cause of the crash was. The field has been cordoned off and police officers are searching the area. The Air Accidents Investigation Branch said inspectors were on their way to the scene. Supt Hannan said that when officers arrived at the scene the helicopter was on fire, and that efforts were being made to establish where the aircraft was going. He added although police were still unaware of what sort of helicopter was involved, they did not believe it to be a military aircraft. One woman said she heard a "thud" as the helicopter crashed. "We actually heard the helicopter fly over and I remarked to my daughter 'My God that was low'," she said. "Then we just heard a thud and that was all until a few minutes later we came out into the garden to finish what we were doing and down at the corner there was police cars, ambulances, fire engines.